It’s a good time to be a fan of both videogames and tennis. AO International Tennis launched earlier this month, albeit to mixed reviews, and Nintendo Switch fans will be able to enjoy on June 22nd (though there’ll be a pre-launch tournament, per our earlier report). However, fans of the tennis simulation game Top Spin are eagerly expecting Tennis World Tour above all as the game is being developed by some of the former talents behind that franchise. Tennis World Tour is out tomorrow on PlayStation 4 and Xbox One, with the PC and Nintendo Switch releases landing in stores on June 12th. It will feature roughly 30 real-world professional players (including Federer, Zverev, Dimitrov, Thiem, Goffin, Isner, Bautista Agut, Pouille, Edmund, Fognini, Kyrgios, Wawrinka, Raonic, Gasquet, Monfils, and two legends like McEnroe and Agassi), motion captured animations and eighteen types of courts including clay, grass, hard, carpet and even hardwood. We’ve talked with Breakpoint Studio’s Creative Director Etienne Jacquemain to bring you in-depth information on the game’s features. Enjoy the read! We took the community’s remarks about the overall speed of the game into account. Now the game and the rallies are faster and more intense, so they’re as realistic as possible. When a player is in the right position, now you can speed the ball up even more, with animations of powerful shots, to finish the rally quickly. We also reworked the different players’ defensive abilities by indexing them to an Agility statistic. Players don’t run at unrealistic speeds anymore. In general, the ball speed is pretty realistic. In Top Spin, properly exploiting the so-called Risk Shots determined the difference between top players and everyone else. Will Tennis World Tour work in the same way at the high-end? overwhelm their opponents without making unforced errors. Tournament features of Xbox Live/PlayStation Network? They are not connected to the Tournament features of Xbox Live / PSN. online tournaments which are much more competitive and will earn them exceptional awards and a lot of points in the online rankings. Can you explain why doubles won’t be available at launch? Do you have any ETA for when they will be added? Doubles gameplay is completely different from 1-on-1 gameplay – it’s not just a question of adding an extra player on each side of the net. That, plus the fact that it takes a lot of time to have a balanced and functional doubles mode, is the reason there won’t be doubles when the game is released. Will there be Hawkeye/Challenges in Tennis World Tour at launch and if not, what are the odds of adding this feature after the release? There won’t be Hawk-Eye/Challenges in Tennis World Tour. Hawk-Eye only makes sense if the umpire can make a mistake – it was created to correct unfairness that can result from human error. Fortunately, in a video game, the umpire doesn’t make mistakes like that, so there’s no real reason to have the mechanism in the game. How often do you expect to add new licensed players post-launch? Also, will it be possible for you to quickly tweak gameplay mechanics or skills balance issues based on player feedback? Our main objective is to increase the women’s roster by adding official players. We will, of course, take player feedback into account and we’ll do everything we can to react quickly and release patches that modify the balance or some aspects of the game. The game is listed among those scheduled to be enhanced for the Xbox One X console. Can you tell us the full specifications of this version as well as your thoughts on the hardware as a whole? The Xbox One X features native 4K resolution at a smooth 60 FPS and better graphics settings. 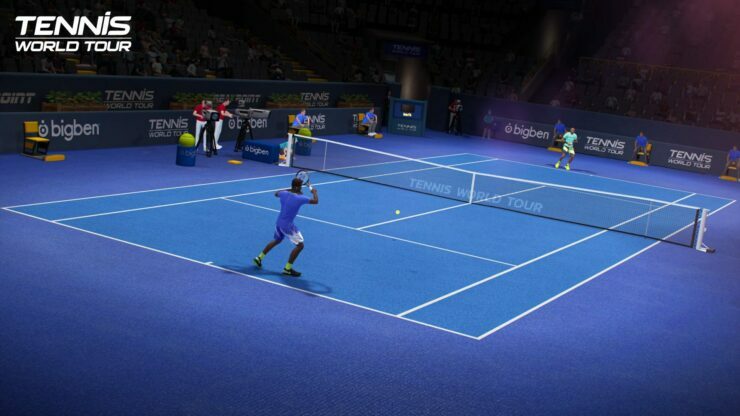 Will Tennis World Tour also be enhanced for the PlayStation 4 Pro? If so, how does it compare in terms of specifications (frame rate, resolution, settings etc.) against Xbox One X? They will be very close to the maxed PC version, but the maxed PC version has a very slight advantage. Will there be support for HDR displays? significantly downgrade the physics and graphics or were you able to keep it basically identical to the other versions? Can you share the technical specs of this version and whether you’ll support motion controls and HD Rumble? The Switch version is slightly downgraded compared to the Xbox and PS4 but it still looks very sharp and with 60 FPS gameplay. We used a range of parameters to save FPS, from low-poly models and stadiums to simplified lighting and shading settings and obviously smaller resolution in handheld mode. Motion controls and HD Rumble are not supported. Did you ever consider the opportunity to enable cross-platform play between PC, Xbox One and Nintendo Switch? Microsoft and Sony. If we have their agreement, then sure, we could do this.